As the Jewish High Holidays approach, Nassau County Executive Edward P. Mangano, Acting Commissioner Thomas C. Krumpter and Arthur Katz, Chairman of Jewish Community Relations Council of Long Island (JCRC-LI), today announced the establishment of a fund to reward individuals who provide information that leads to the arrest and conviction of anti-Semitic crimes. The fund is made possible by a donation from Roslyn resident Brad Gerstman, who spearheaded the effort in light of increased incidents of anti-Semitism. The Jewish Community Relations Council of Long Island has created an escrow account that will be used to fund rewards and will accept donations of any size. Decisions regarding the allocation of rewards will be made on a case-by-case basis by the JCRC in consultation with the Nassau County Police Department, District Attorney’s Office, and other law appropriate law enforcement agencies. “I would love to solve the world problem of anti-Semitism, but that isn't realistic, so I want to help make sure Long Island stays safe from anti-Semitic hate crimes. That's why I am joining with County Executive Ed Mangano, Acting Police Commissioner Thomas Krumpter and the JCRC to create this fund,” said Brad Gerstman. “I am grateful to Brad Gerstman who thought of this idea and brought the concept of this fund to my attention. If not for Brad, this fund would not be a reality, andJCRC-LI is proud to play a role actualizing Brad’s vision. JCRC-LI also values the commitment of Nassau County’s Police Department on this endeavor. We look forward to working with the Suffolk County Police on a similar fund,” said Arthur Katz, JCRC-LI Chairman. The mission of JCRC-LI is to inform and mobilize the Long Island community to take action locally, nationally, and internationally to address community relations issues important to both the Jewish and non-Jewish communities. JCRC-LI focuses on fostering positive and meaningful inter-group relationships, serving as a resource for information and advocacy about Israel and international affairs to the Jewish and non-Jewish communities of Long Island, maintaining an on-going dialogue between the Jewish community and governmental officials at the local, state and federal level and serving as an umbrella for Jewish institutions across Long Island. 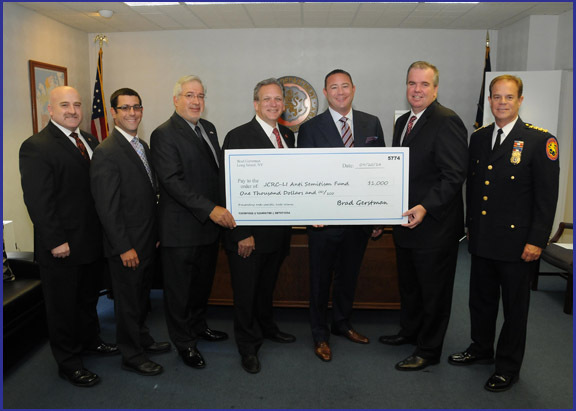 Pictured (left to right) are: Detective Lt. Gary Shapiro Commanding Officer of Community Affairs; David Newman, Executive Director of the Long Island Jewish Community Relations Council; Arthur Katz, Chairman of the Long Island Jewish Community Relations Council; County Executive Ed Mangano; Brad Gertsman of Roslyn; Acting Police Commissioner Tom Krumpter; and Chief of Department Steve Skrynecki.